Pyne Library, the sesquicentennial gift of Mrs. Percy Rivington Pyne, mother of Moses Taylor Pyne, Class of 1877 (1855-1921), was added to Chancellor Green in 1897. 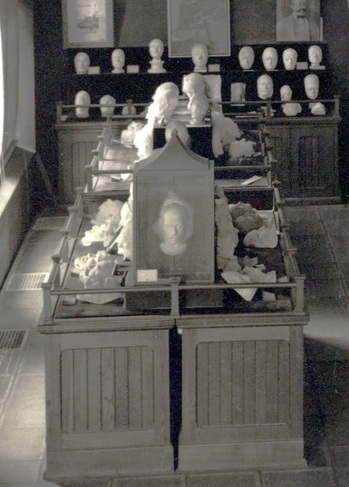 In one of its alcoves, a long-term exhibition was mounted of the Lawrence Hutton collection of death masks, donated to Princeton University that same year. Our collection includes an unmarked mask, unusually cast in cement rather than plaster and, because of its enormous weigh, permanently housed in a wood frame. Is the mask below (also in the center of the photograph above), the 1908 mask of the 22nd and 24th President of the United States? 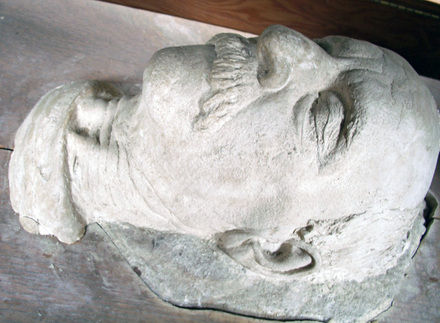 Death mask of Grover Cleveland?, 1908. Cement in wood frame. 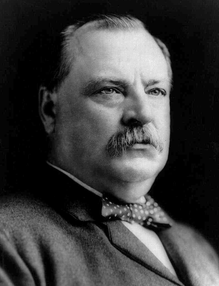 Donated by Mrs. Grover Cleveland. Guy J. 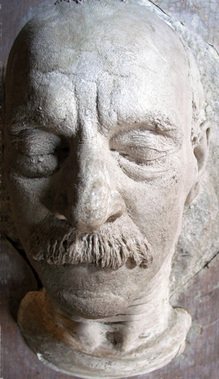 Wells, “Firestone Houses Death Masks of Kings, Musicians, Presidents,” Daily Princetonian, 73, no. 136 (8 November 1949).